You'll find "well travelled food and mighty fine coffee, in an old grain store" at Caravan King's Cross, a succinct description they came up with themselves. The second Caravan to open, following huge success with their Exmouth Market original, is the brainchild of four New Zealanders and is, "already colonised by the cool kids from Saint Martins" (next door), reported The Metro when the restaurant first opened in August 2012. Starters of clay oven courgette, octopus or chorizo and butternut squash croquettes with a "melt-in-the-mouth potato centre" (The Standard) are followed by a choice of pizza or large plates. A sample of these main courses includes Israeli couscous with feta, aubergine and pumpkin seeds, sea bass cooked in a mussel and saffron broth, and lamb leg chop which comes with kale, ratte potato and anchovy butter. But, as with the original restaurant, the focus is on all-day dining so you can choose small or big plates, sides and puddings, whatever the time of day, but do note that there are no bookings for brunch on the weekends. Caravan King's Cross gyms, sporting activities, health & beauty and fitness. The best pubs near London Caravan King's Cross. 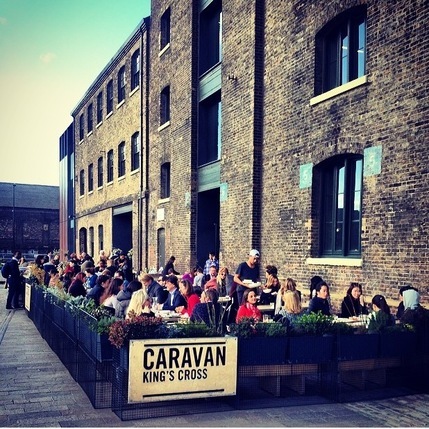 Caravan King's Cross clubs, bars, cabaret nights, casinos and interesting nightlife. Where to have your meeting, conference, exhibition, private dining or training course near Caravan King's Cross. From cheap budget places to stay to luxury 5 star suites see our deals for Caravan King's Cross hotels, including DoubleTree by Hilton London - Islington from 79% off.